With the Spring 2019 release of Microsoft Dynamics 365 Finance & Operations, Projects+ is coming up with lot of exciting features and enhancements. Continue reading this article for more information on new features and enhancements coming your way. These features are currently in the preview stage. If you would like to try out some of these features please reach out to us here or email us. Communicating with right person is seamless now with embedded Microsoft Teams chat buttons. An user can immediately communicate with the right person form the form they are already in. Timesheet Entry – Chat button on this form will allow resources to chat with the project manager. The project manager in this case is the person assigned on the project as project manager for the selected record. Project invoice proposal – Chat button on this form will allow project accountants to chat with the billing approver. The billing approver in this case the is person assigned on the contract as billing approver for the selected invoice proposal. Personal Time Off – On this form, resources can chat with the time approver. The time approver in question here is person assigned to the resource as time approver. Manage Pending time – Chat button on this form will allow resources to chat with the project manager. The project manager in this case is the person assigned as project manager on project for the record. All missing timesheets – On this form, Project manager/ Accountant can chat with the timesheet user and time approver. The time approver in this case is the person assigned to the resource as time approver. My Employee Missing timesheets – On this form, time approver can have chat with timesheet user. The time approver in this case is the person assigned to the resource as time approver. My Project missing timesheets – On this form, project manager can chat with timesheet user as well as Time approver. The time approver in this case is the person assigned to the resource as time approver. My Project activities – On this form, employee can chat with project manager related to project tasks. Timesheet line level approval – Chat button on this form will facilitate the project manager to initiate chat with the resource. Reviewing the project invoice documents and taking desired action on them is now hassle free with new feature from Projects+. 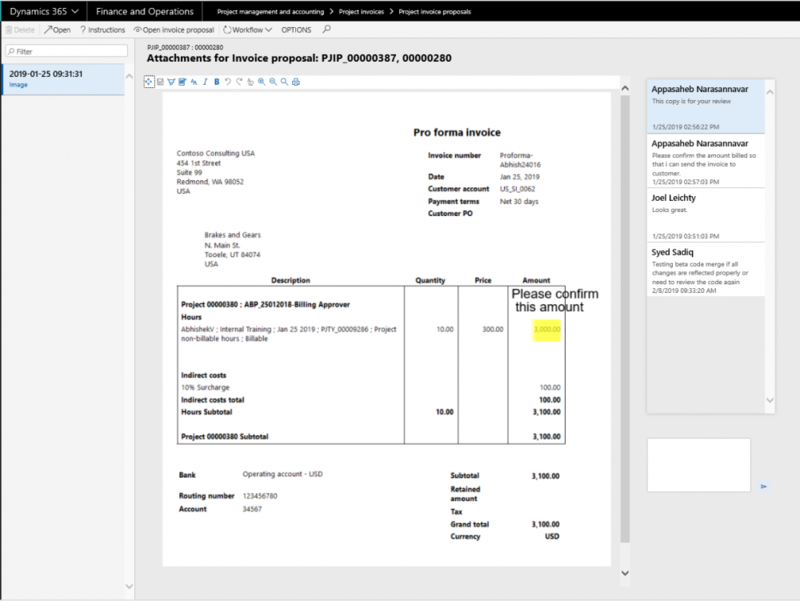 This new feature provides the ability to write electronic notes on Invoice proposals as part of the Invoice workflow. Also, comment section is available on this form to convey the right\specific information to the concerned person. The version history of proposal documents and comments is saved and available for future reference. This new functionality is controlled through a parameter. Managing subprojects with current design in Microsoft Dynamics 365 Finance and Operation is difficult. Projects+ introduces a new feature to ease this process. With this feature, projects and subprojects can be managed on a single window. Projects and subprojects are represented in hierarchical structure, makes it easier to interpret details. This feature also allows you to number the projects according to your needs. Values on the subprojects defaults from the parent projects, however these values are editable. This feature also allows you to import and export the data into the project and sub projects. As an employee you might want to have a place where you can look for all the project activities assigned to you. Projects+ brings out a new feature, which will give you that exact details. This new form displays all the tasks (across projects) for the logged in resource which are assigned to them. The new form will be available on the Project tasks workspace and will accessible to project timesheet user and employee roles. The functionality introduced here will allow the implementation teams to manage the licensing information in a better way, which in turn reduces the implementation timelines for box implementations. 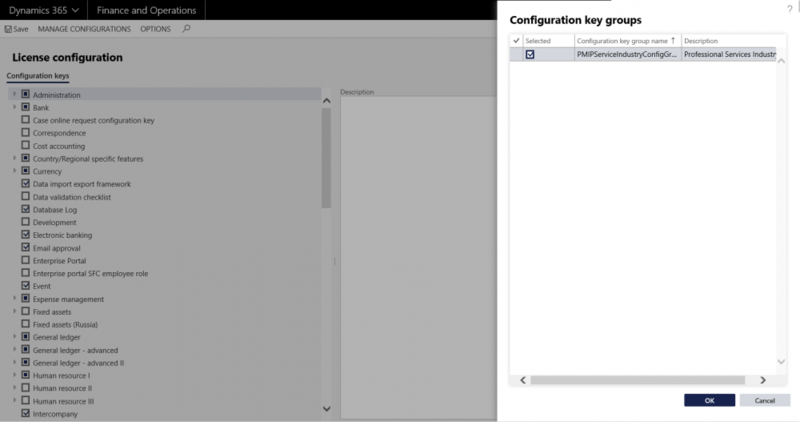 This new feature in Projects+ provides the ability to activate or deactivate certain Dynamics 365 Finance and operations features or modules out of the box. To achieve this we have created certain predefined keys containing the combination of modules which service industry often uses. Project view have an updated user interface. This form now has tree control for better representation of projects and sub-projects. This form is revamped keeping in mind the ease of use for the project managers to manage sub-projects. Updated form has three sections to it. Tree section displays the projects and sub-projects. Project summary section shows the hard booked and soft booked hours for the selected project. The third grid i.e. Project hour entry, shows details of the selected projects. Project status button allows project managers to switch from project management workspace to project status workspace seamlessly. The Project status workspace opens with details of the project selected on the project management workspace.. The functionality is introduced to submit the timesheet automatically when the user transfers the time from Manage pending time.This new functionality is controlled through a parameter.